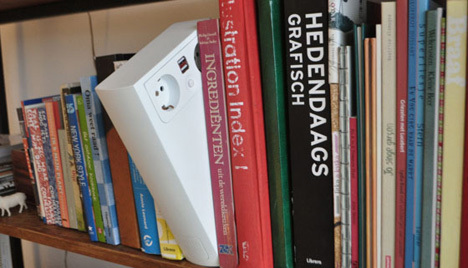 it’s essentially a retractable extension cord (bear with me here) in which the spool is concealed in a rather conspicuous plastic housing… so conspicuous, in fact, that Hakkens was inspired to highlight the chunky book form factor. My goal was to create a little extension cord to use for small in-house jobs. 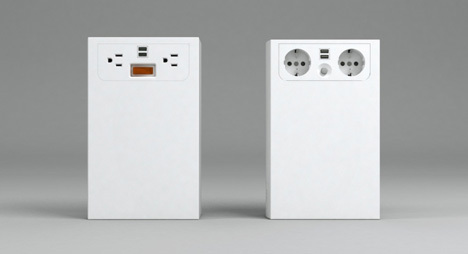 Like charging your laptop, drilling a hole, connecting a lamp etc. I wanted it to be just there, in the middle of your living room without being obstructive and with a good working cable. If you need it, you now where it is and you can just take it, without a hassle. 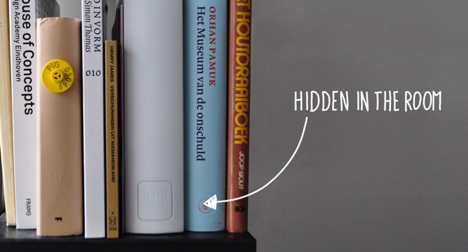 The plugbook is made in the shape of a book which hides itself between your other books. When you need it, just take it out and pull the cord. Simple as that! Inside the book is 10 ft (3m) of cable. 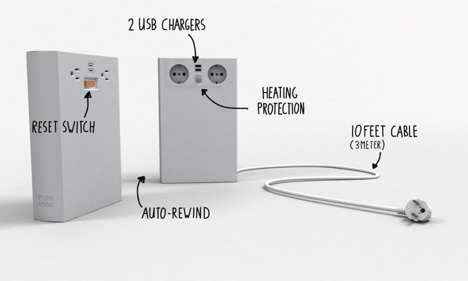 We also added an extra power socket and 2 USB ports to easily charge your iPad, iPhone, Smartphone, Camera and many other devices. And when you don’t need it anymore you press the button and the cord automatically rewinds itself (like in a vacuum cleaner). And just put it back on the bookshelf ready to go for next time. In any case, Hakkens is looking to Kickstart his latest project and he’s raised a little more than half the funds with just under a week and a half to go. It’s currently priced at $25 apiece—check it out (and help him out) by clicking below. ← ‘You’re Not Special’: Speech Was Honest or Mean? As a engineer student I am very happy to know your writing concept. That student make the design which is look so safety and protect-able in my view. qi charger for galaxy note 3 also able to give us all kind of high quality USB charger wireless charger with guarantee and responsible price. Nice comment here. Keep sharing your views. As a student I highly appreciate your concept about the Plugbook concerning issue. That is totally new one knowledge to all of us and I hope it'll be success for a good review. Students should be concentrate on your study because his or her presents lot of money spend of you while he became a business man, doctor of our society and also beneficent for other people.